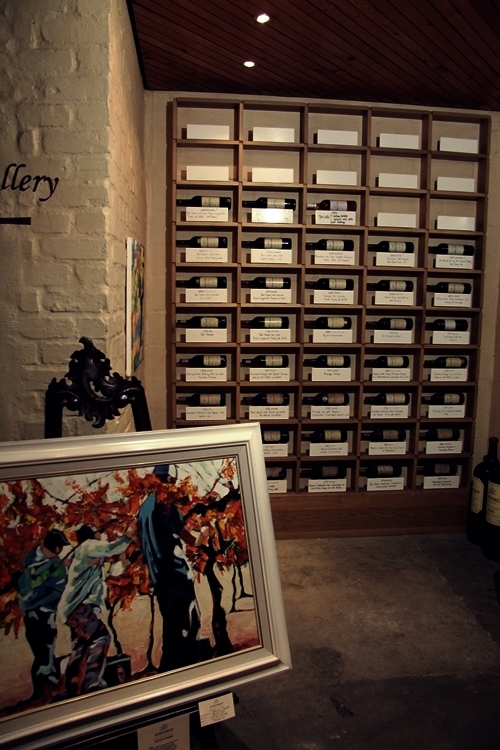 Kanonkop is located on the foothills of the Simonsberg Mountain, in the Stellenbosch wine region. Approximately ten kilometres north of Stellenbosch on the R44, and roughly an hour’s drive from Cape Town. 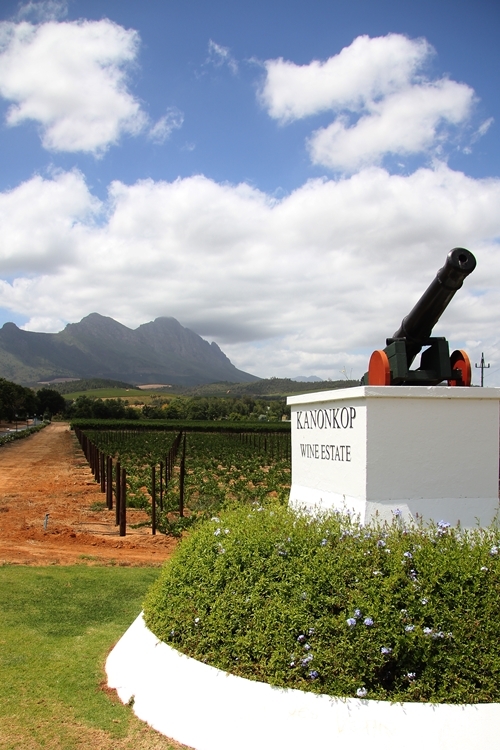 The Estate is named after the cannon, which was fired in the 17th Century to alert farmers in outlying areas that sailing ships had entered Table Bay for a stopover at Cape Town. Here the iconic cannon, that is found at the entrance to Kanonkop. 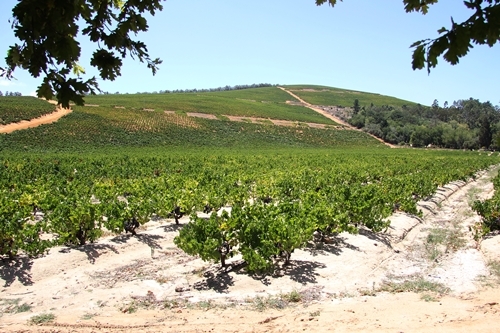 The old Pinotage bush vines cover a significant percentage of their 100 hectares of vineyards. 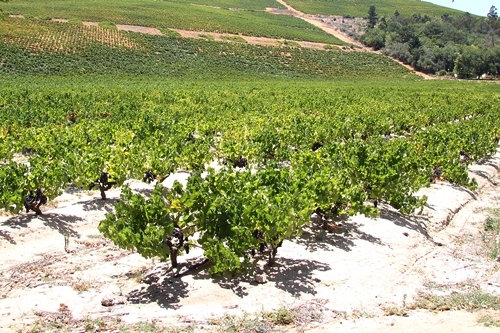 Pinotage is a grape variety that is unique to South Africa, as it was created here. It is a cross between Pinot Noir and Cinsault, and it has experienced a real revival over the last decade or so. 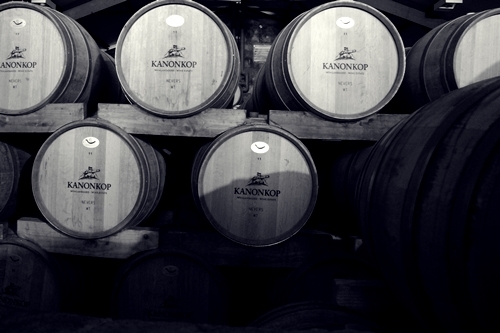 Kanonkop was one of the first estates to plant Pinotage in 1941. 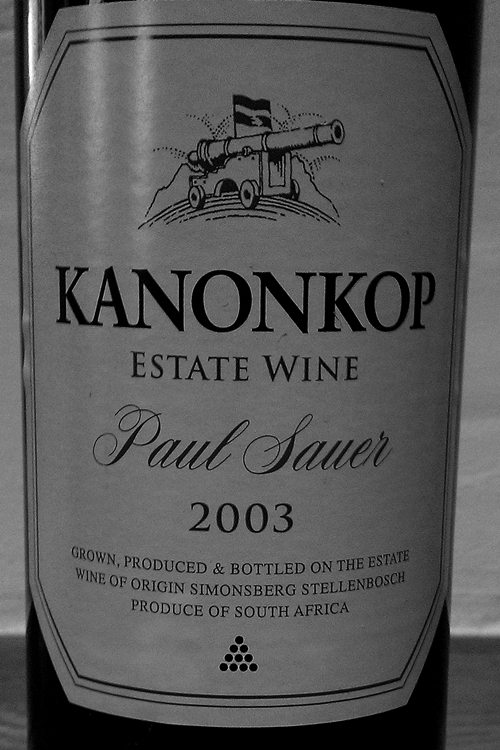 It is due to this fact that Kanonkop today has some of the oldest farmed Pinotage vines from 54′. Here the entrance to their tasting room. 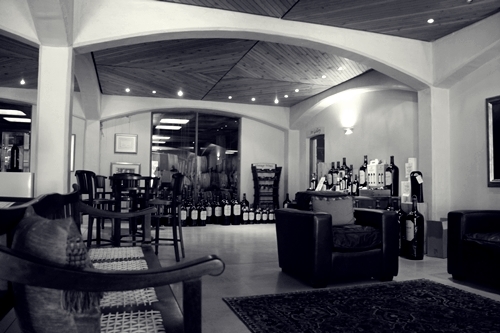 Their tasting room is decorated with a generous amount of big bottle releases, and a view to the barrel room. The large format bottles are here to tell the story of how extraordinary well their wines can age. 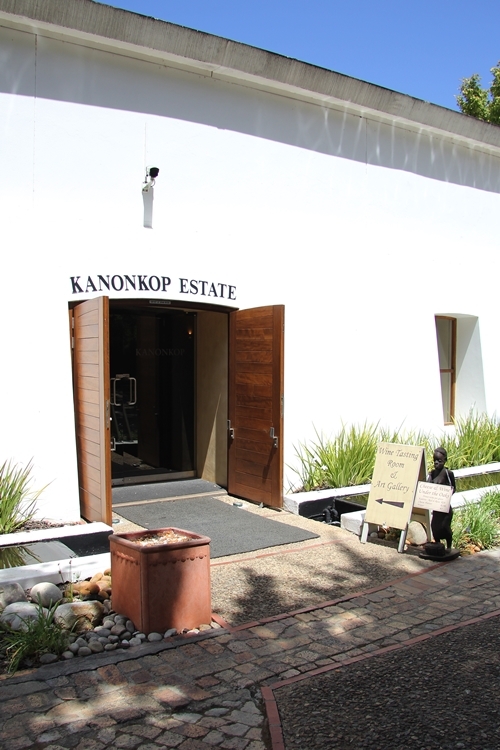 Kanonkop’s history told through selected vintages. 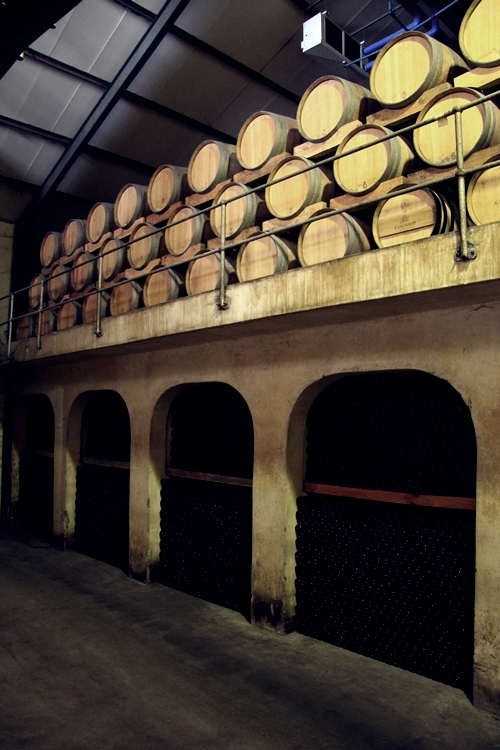 The two storey barrel room at Kanonkop. Here their wines spend between 14 to 26 months. The French oak barrels are a mixture of new and 2nd fills. They are predominately made of oak from the Nevers forest, and are often medium toasted. Their winemaker Abrie Beeslaar emphasise on using only a small selection of coopers, and has taken a liking to the barrels from the Vicard Cooperage. 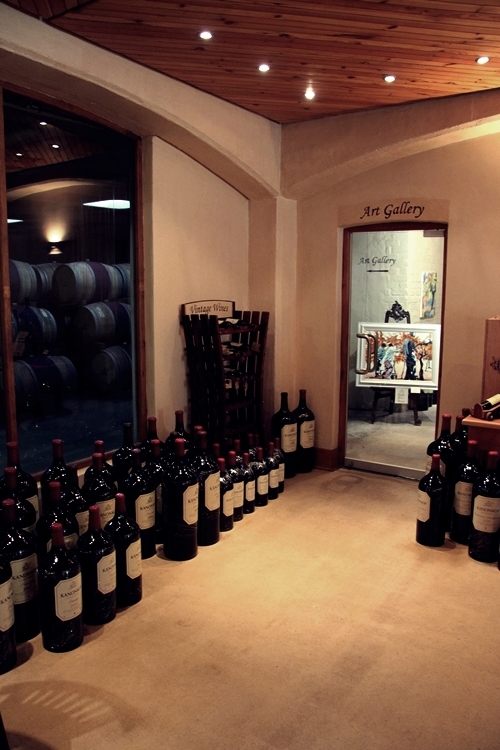 Most of their wines are, as the picture reveals, also bottle aged before their release. 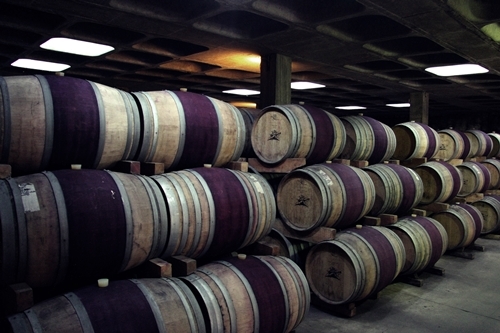 The long barrel ageing of sometimes more than two years, gives very complex wines. The many layers appear clearer after years of bottle ageing. 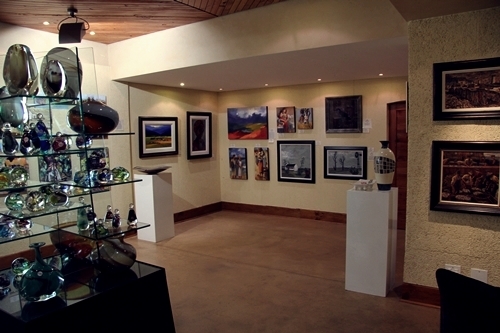 The small gallery at Kanonkop houses both glass, sculptures, and paintings. 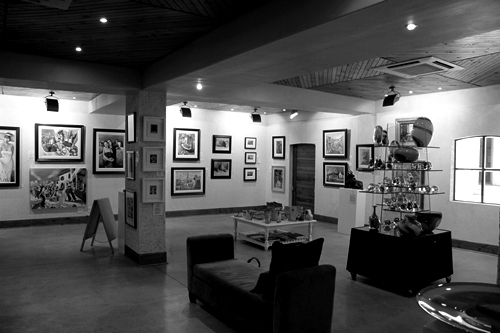 Their gallery focus mainly on South African artists, and the art often depicts the local scenery. Several tastings are available; I recommend booking a private tasting and adding their new icon “Black Label Pinotage” to it, especially if you visit with a small group of friends. I tasted the 2010 Pinotage rosé, the 2010 Kadette, the 2009 Pinotage, the 2008 Cabernet Sauvignon, and the 2010 Black Label Pinotage. 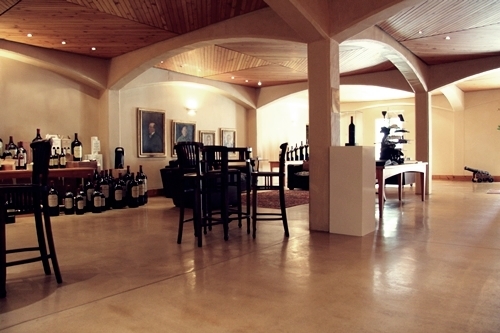 The Black Label Pinotage is not on the tasting, since they only make 1000 bottles per year. You can though purchase a bottle, if not sold out. The famous “Paul Sauer” blend was in fact completely sold out, when I visited. 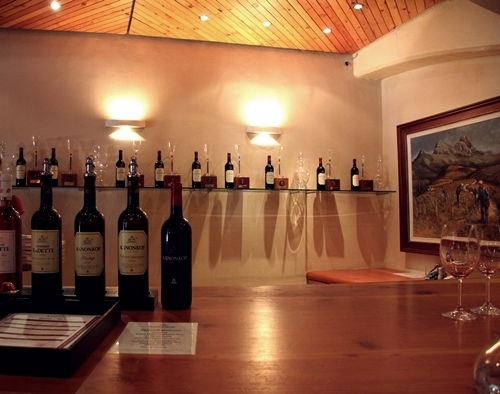 Paul Sauer is the flagship blend of Cabernet Sauvignon, Cabernet Franc and Merlot. It is named after the founder of Kanonkop, and been a collector´s item for decades. Quality is high, even in the Kadette. The Cabernet Sauvignon has a very similar style to the Paul Sauer, and gives a lot of wine for its price. I recently opened a bottle of Paul Sauer from the 2003 vintage. It is a very good example of a classic Kanonkop. The vintage is regarded one of the best in their history, due to a cold, wet winter, which resulted in a slow ripening period. The 2003 is a blend of 63% Cabernet Sauvignon, 31% Cabernet Franc and 6% Merlot. The wine has many complex layer of chocolate and tobacco, underlined with earthiness and spice. A brilliant wine! The Black Label Pinotage is to this date the world’s most expensive Pinotage. It is a combination of having some of the first Pinotage vines planted and dry farming them, which give extraordinary fruit and low yields. The wine is fermented in open concrete tanks, with punhdowns, and the 2010 spent 16 months on some of the finest new oak. An incredibly smooth style for a Pinotage. It is very complex and has many layers of dark fruit and ripeness.